There’s always that one elusive product that you’ve been meaning to try for aaages but you somehow never get round to. Everytime you remember and go to the shop, it’s out of stock. Then you see an advert on TV or hear someone talking about it – so you head to your nearest beauty dealer and wait… the shop doesn’t sell it. For me, that annoyingly unobtainable product was this. 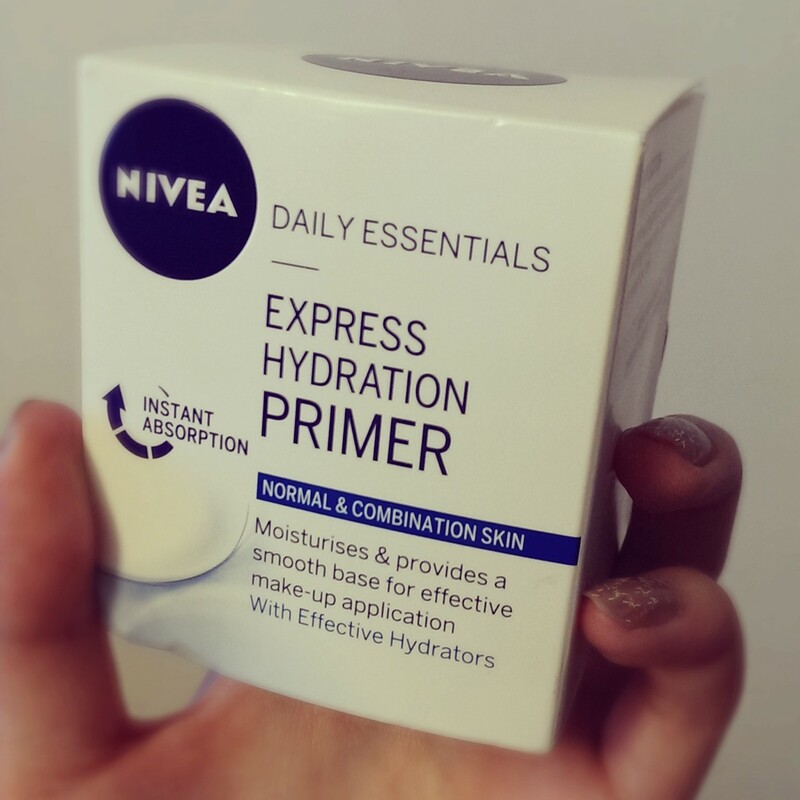 The Nivea Daily Essentials Express Hydration Primer. Before I bought this Hydration Primer, I didn’t really use primer every day. It’s an extra step to my routine, it makes my skin feel a bit clogged and most of the time, I just couldn’t be bothered! I know you know the feeling.. 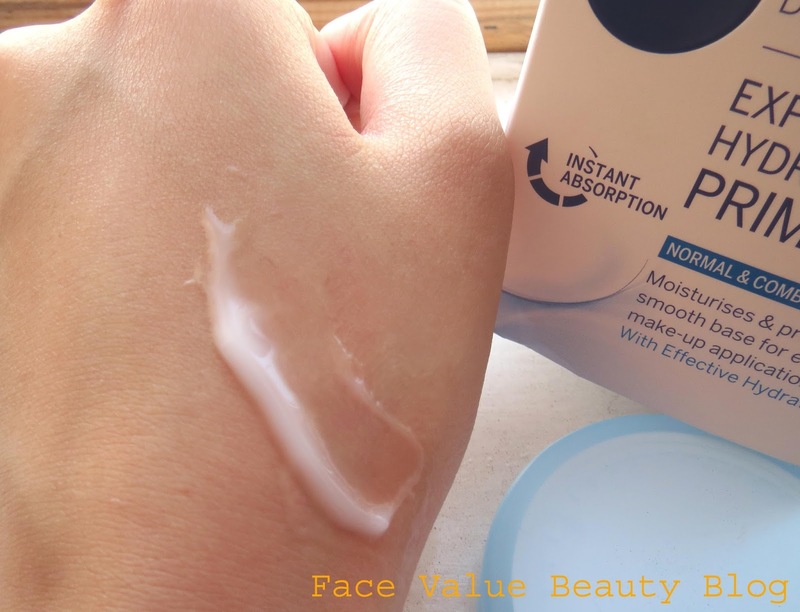 I love the silky feel of silicone-based primers like Benefit Porefessional and DHC Velvet Skin Coat but after a while they just start to feel oily and slippy on my skin. 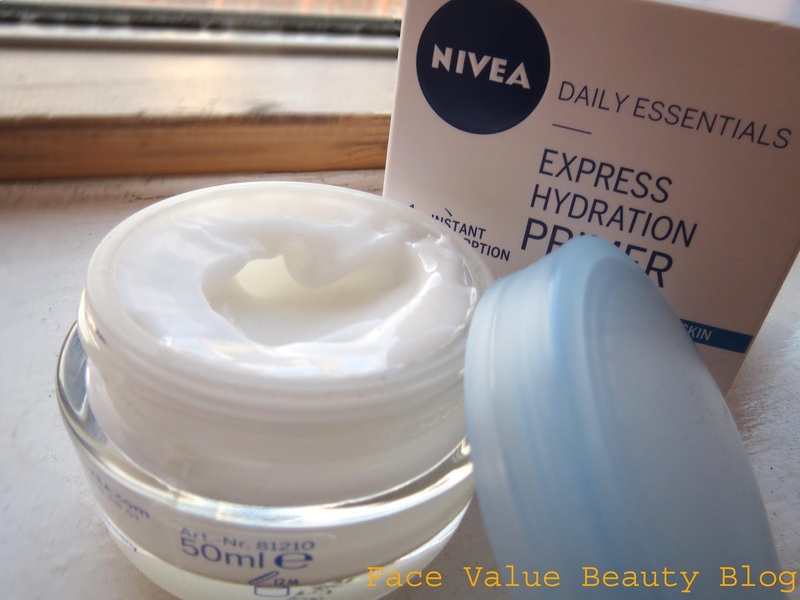 The Nivea primer feels just like a light day cream – lighter than Nivea original cream, more like the Pure & Naturals/Essentials day cream. Lovely and refreshing for my normal/oily skintype but probably not heavy duty enough to use alone on dry skin. When I bought my latest fave foundation (Bareminerals Ready Foundation, review here) – I realised that, to get the perfect finish, my skin needed to be even, smooth and with uniform hydration across the whole of my face. Anything less and my powder foundation applied a bit patchy. Being the lazy gal that I am, I didn’t want to wait ten minutes for my moisturiser to sink in properly did I? I wanted results and fast! So I now apply this in place of my day cream and it dries quickly with a matte and even finish. You can apply it over your normal day cream/serum but for my normal/combination skin, just the primer alone is enough. I absolutely love this and would definitely buy it again! It smells lovely and it’s a bargain for 4.99, especially if you use it as your day cream as well! It’s perfect for anyone who uses powder foundation, I’m so glad I fiiiiinally found it! What products have you been meaning to get for ages and never got round to? Do you use a primer? What’s your favourite? Body Shop Haul: Smooth Skin & Self-Adjusting Colour! Previous Post Hiding the bank holiday hangover with Clinique Even Better Concealer. Next Post MONEY MONDAY: Cheaper Flights For That Smug Holiday Feeling.